Building an Ancient DNA Atlas of Humanity: Ancient DNA allows us to go beyond the two-dimensional understanding of human genetic variation based on the coordinates of latitude and longitude, and to develop a far more powerful three-dimensional understanding now adding the coordinate of time. We are working with archaeologists, local stakeholders, and others to study ancient peoples and cultures from all across the world to learn about humanity and answer questions about our shared past. 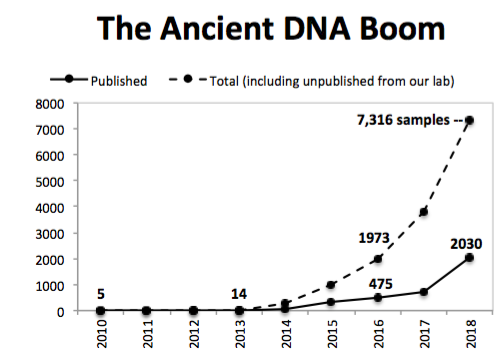 Making ancient DNA accessible to archaeologists: At present, genome-wide ancient DNA analysis is so new and technically complicated that it can only be carried out by a small number of laboratories. But ultimately, ancient DNA analysis is likely to follow the path of radiocarbon dating, another scientific technique that transformed archaeology that similarly was just the province of experts when it was first invented. Radiocarbon dating only realized its full potential once archaeologists mastered the skills to interpret this data, and we are similarly committed to putting ancient DNA into the hands of archaeologists. Leveraging ancient DNA to understand human adaptation: Ancient DNA has already been a runaway success in improving our understanding of population movements and mixtures. But so far there has been little progress in shedding light on how the forces of natural selection have shaped human traits over time, because what is required for this is the ability to track the frequencies of mutations over time which requires large sample sizes. We are generating the large datasets needed to make such studies possible. Leveraging an understanding of population history to reduce suffering and disease: The more we learn about human populations, past and present, the more we can apply this knowledge to address practical needs such as targeting medical services to people who need it. A major focus of our lab has been to document how many endogamous groups in India have experienced population bottlenecks stronger than those in Ashkenazi Jews or Finns. This predicts that there will be many rare recessive diseases in India, which can be found and tested for using modern genetic methods. We are working alongside colleagues in India to carry out pilot studies to prove the power of this approach.